A float gives us the opportunity to give a gospel tract to everyone who came to see the parade. We have not yet had a float in a parade. The picture to the right is a picture of the Sherword Robinhood Festival Court. 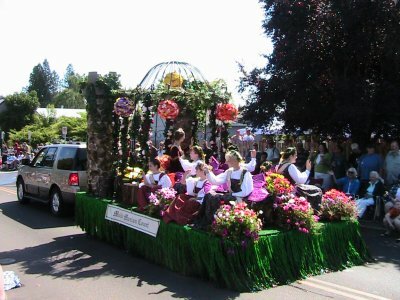 I've seen a number of parade floats with a church worship band on them. But people only get to hear part of a song. More is needed. No matter what we have for a float, we need a large group of people walking along with the float. Their job is to give a gospel tract to everyone. With a float having a conversation is very unlikely, because the float must keep moving. If we have a booth at the festival, anyone who wants to talk more can be invited to the booth.